The Deep Bleeder Acoustic Coagulation Cuff is the result of a collaboration of universities and corporations working with DARPA. It is hoped that the semi-automatic ultrasound device could help keep soldiers from losing too much blood. The goal of the Deep Bleeder Acoustic Coagulation (DBAC) Program is to develop a portable, lightweight, noninvasive, automated system for the detection, localization, and coagulation of deep bleeders that is operable by minimally trained personnel in the combat environment. The DBAC system will cover the full range of life-threatening bleeders―from the fast bleeder, which causes progressive shock in 30 seconds, to the slow bleeder, which causes progressive shock in 8 hours. Delivery and dosing of high-intensity focused ultrasound (HIFU) has been extensively modeled and tested. Results show that tissue can be raised to within the range of 70 °C to 95 °C to safely achieve acoustic hemostasis within an operationally relevant timeframe of 30 seconds. 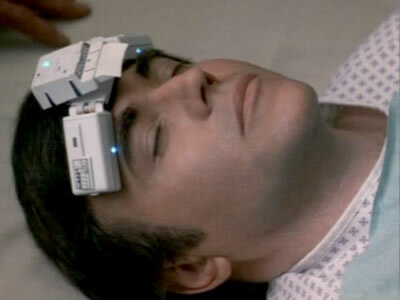 Star Trek fans recall that Dr. McCoy had a nifty device that allows him to avoid cutting patients open; he angrily locks 20th century physicians in a closet rather than let them touch Chekov with their "butcher knives" when he has a cerebral hemorrhage. From Deep Bleeder Acoustic Coagulation via CNET.